I've had one of those discovery moments, similar to when I first heard Hadouk Trio (thanks DTB) and Renault Garcia-Fons (Oriental Bass). 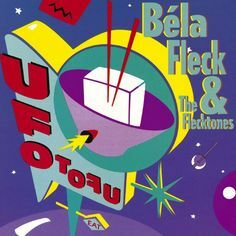 Bela Fleck and the Flecktones is new to me and I just love their fusion of Jazz, Bluegrass and Funk. Furthermore, their recordings are first class and will give any system a thorough work out. I started with their third album, UFO Tofu. Sorry, not sure how to embed album art images. I have also been listening to four other albums of theirs, 1. (Title as band name), 2. Flight of the Cosmic Hippo, 4. Three flew over the Cukoo's Nest and 5. Rocket Science. Highly recommended unusual original sound which can be sampled on uTube, or streamed if you are set up for that. Yups, been a fan for a good few years. Live, they can be very funny as well as stunningly brill musicians. Lots of vid's of their antics on YouToob. Last edited by Dave the bass on Thu Nov 10, 2016 4:55 pm, edited 1 time in total.